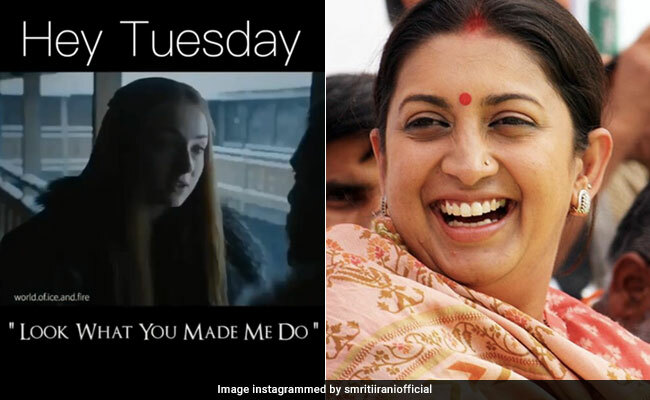 Smriti Irani's post on Tuesdays will make you laugh out loud. After declaring her less-than-favourable opinion of Mondays to the world, Union Minister Smriti Irani is now targeting Tuesdays with the perfect song. This morning, Ms Irani shared an Instagram post using a mashup of Taylor Swift's hit song Look What You Made Me Do with a Game of Thrones video. The post has proved to be a big hit with both Game of Thrones and Taylor Swift fans. It has already collected over 8,000 views and a ton of appreciative comments. "So relatable," laughs one person in the comments section. "SWIFTIE!" says another. Smriti Irani is now well known for sharing hilarious posts on Instagram. Yesterday, her Monday blues post quickly went viral. What do you think of her latest post? Let us know using the comments section below.